Do you want an instant training program that will get results and anyone can lead? If you want to improve the communication, interpersonal relationships, people skills and build rapport, relationships and connect with customers, co-workers and employees, here is an affordable and effective option for you. If you want an outcome where the training sticks and the key messages are reinforced I have the solution. We’ve come up with a unique and simple plug n’ play tool that that will take the best ideas from my book on “Getting Along” and make them stick, so there is an actual improvement in workplace performance resulting in you getting an enhanced return on investment. Managers, leaders, team members and almost anyone can now quickly and easily facilitate fun, fast and effective meetings that reinforce all the key ideas on communication, getting along, building rapport, relationships and connections. 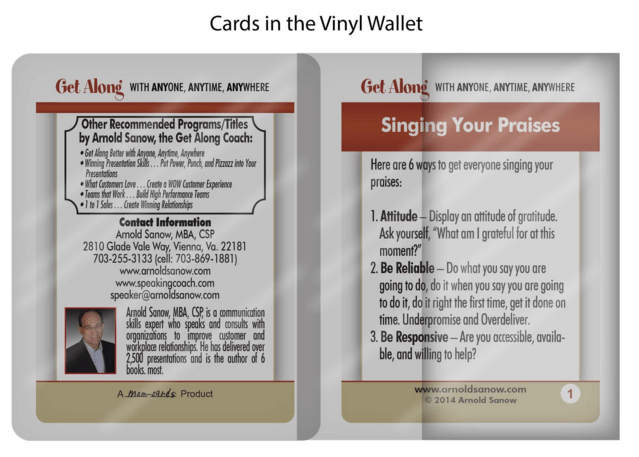 It works because everyone loves cards (the vehicle) and everyone love Cliffs Notes… less is more, right? 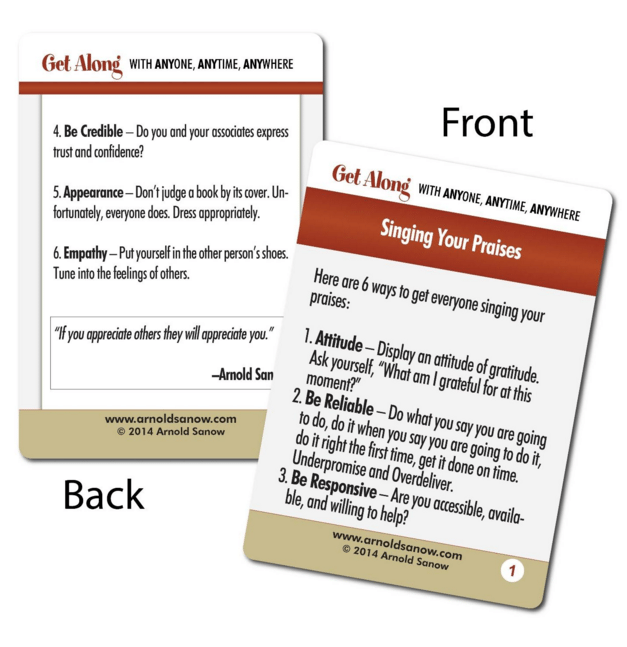 Then, when you give Managers/Leaders/Employees the instructionally-designed exercises with the cards, that basically run the meeting for them—shazaam—instant buy-in and success. If you would like to improve the learning outcomes, please contact me at 703-255-3133 or speaker@arnoldsanow.com. Get 20 decks and 20 exercises for one flat fee. Extra fee for more decks. Please see sample pictures below and a couple exercises you can do with the cards. Procedure: Pick a card at random from the deck. Give yourself exactly 60 seconds to read and interpret it. (Use a timer.) Give yourself exactly 30 seconds (elevator speech) to summarize, out loud, the key message. Do this daily with one or two new cards until you can spontaneously explain every card individually in 30 seconds or less. Variations: Play with a partner. Each of you must express the idea in 30seconds or less to your partner’s satisfaction. You can play with a group. Each takes a turn. The group votes to accept or reject the 30 second summary. 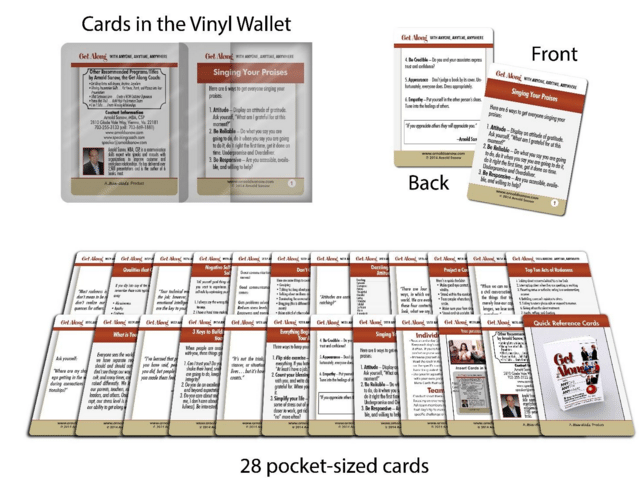 Objective: Give concrete, relevant examples of concepts and principles presented in the cards. Procedure: Pull a card at random from the deck. Rapidly read the front and back of the card (if card contains content on both sides). Create a concrete example of application in your work setting. If you can’t, either go to the book from which the content was drawn or consult others. Alternatively, place the card on your workspace to reflect upon until you come up with a concrete example. Variations: In a group of four or five, each player pulls a card and writes a concrete example on a sheet. When everyone is done, pass the card to the next player on the right who creates an example on his/her sheet. Continue until all players have created concrete examples for all cards and each player has his/her original card. Each player reads his/her card content and players in turn share their examples. Objective: Apply the content of the cards to your daily life and work practice. Procedure: Each day, randomly select a card. Read the front and back (content and quote if there is one). Reflect on what the card says. Leave it on your desk or prominently displayed in your work area so that it stays in view. Hunt for an opportunity to apply it or help another person apply it. Keep a record with card number and application. Each day, select a new card. Share your successes with others.